Winter is here and people are freaking out! 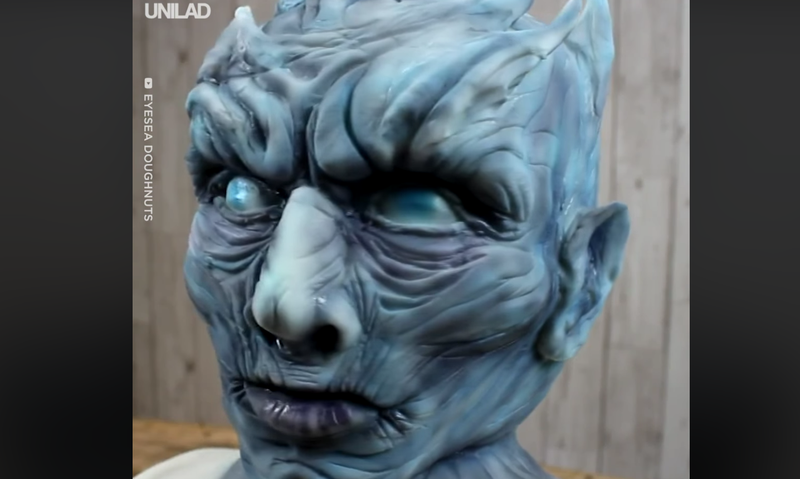 Why not impress your friends with this gorgeous Night King from 'Game of Thrones' cake?! A colleague of mine was super impressed when they heard that I was a 'Game of Thrones' fan. I did mention before that I love movies and series, and, I mean, who doesn't love a bit of Jon Snow, right? Season 8 was released today, and fans all over the world (including myself) are flipping out over it. And, yes, I did get up at 3:00am to watch it - because I'm obsessed! I'm not going to give much away because I'm not that girl that loves to spoil things for others, but all I'm saying is that if you don't want to know what is going to happen, please stay away from Twitter. In case you don't know about it, 'Game of Thrones' is an American fantasy drama television series that is set on the fictional continents of Westeros and Essos. There's so much more I want to say, but I actually want to give you the joy of going and binge-watching it yourself. Easter weekend is approaching, so perhaps consider locking yourself indoors and watching all seven seasons? If you have a lot of time to spare and a cake decorating spray gun, you're going to want to check out this 'Game of Thrones' Night King cake. Okay, it's a bit extra but the finished product is enough to blow anyone away. READ: Make your own Game of Thrones pancakes! Winter is here, so let's embrace it!